John Von Neumann was a polymath and pioneer of the application of operator theory to quantum mechanics, in the development of functional analysis. Along with fellow physicists Edward Teller and Stanislaw Ulam, von Neumann worked out key steps in the nuclear physics involving thermonuclear reactions and the hydrogen bomb. Von Neumann wrote 150 published papers in his life; 60 in pure mathematics, 20 in physics, and 60 in applied mathematics. His last work, published in 1958 “The Computer and the Brain”, explores the analogies between computing machines and the living human brain. 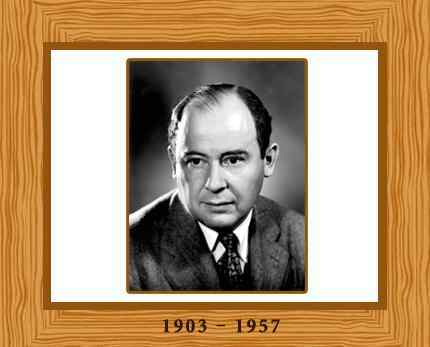 John von Neumann was born on December 28, 1903. He was a Hungarian-American mathematician who made major contributions to a vast range of fields. The eldest of three brothers, von Neumann was born Neumann Janos Lajos. Von Neumann’s ancestors had originally immigrated to Hungary from Russia. John was a child prodigy who showed an aptitude for languages, memorization, and mathematics. By the age of six, he could exchange jokes in Classical Greek, memorize telephone directories, and displayed prodigious mental calculation abilities. He initially studied chemistry and mathematics at the University of Berlin until 1923 when he went to Zurich, Switzerland where he received a degree in chemical engineering in 1926. The following year he received his doctorate in mathematics from Pázmány Peter University in Budapest at the age of just 22 with a thesis concerning axiomatization of Cantor’s set theory. From 1926 to 1927 von Neumann did postdoctoral studies under David Hilbert at the University of Göttingen. Neumann worked at German universities until 1930, concentrating on quantum mechanics. John Neumann married twice. He married Mariette Kövesi in 1930, just before emigrating to the United States. They had one daughter. He then divorced her in 1937 and married Klari Dan in 1938. In 1933 he became a mathematics professor at the Institute for Advanced Study in Princeton, New Jersey and he kept this position until his death. In 1937, von Neumann became a naturalized citizen of the US after migrating to America with his mother and brothers. In 1938, von Neumann was awarded the Bôcher Memorial Prize for his work in analysis. During the Second World War he worked on the Manhattan Project to produce the first atomic bomb. Following the war Neumann became a consultant to the American government and industry in addition to his professorship at Princeton. In 1932 Von Neumann published his book “The Mathematical Foundations of Quantum Mechanics” which established a strong mathematical framework for quantum physics. He created the field of cellular automata without the aid of computers, constructing the first self-replicating automata with pencil and graph paper. His interest in meteorological prediction led him to propose manipulating the environment by spreading colorants on the polar ice caps to enhance absorption of solar radiation, thereby raising global temperatures. Von Neumann’s principal contribution to the Manhattan Project and the atomic bomb was in the concept and design of the explosive lenses needed to compress the plutonium core of the Trinity test device. Von Neumann’s hydrogen bomb work was also played out in the realm of computing, where he and fellow physicist Stanislaw Ulam developed simulations on von Neumann’s digital computers for the hydrodynamic computations. He contributed to the development of game theory as a mathematical discipline and together with Stanislaw Ulam devised the Monte Carlo statistical sampling method, which allowed complicated problems to be approximated using random numbers. Von Neumann’s significant contribution to mathematical economics was the minimax theorem of 1928. This theorem establishes that in certain zero sum games with perfect information, there exists a strategy for each player which allows both players to minimize their maximum losses. An astoundingly creative mathematician, John von Neumann has played an important role in post-war economic theory. He published “Theory of Games and Economic Behavior” in 1944 which detailed a groundbreaking mathematical theory of economic and social organization, based on a theory of games of strategy. Throughout his life von Neumann had a respect and admiration for business and government leaders; something which was often at variance with the inclinations of his scientific colleagues. John Neumann died in February 8, 1957 (aged 53) from bone cancer in Washington, D.C., United States. The year before, in 1956, he had received the first Enrico Fermi Award.